"Spec Ops" redirects here. For the video game series, see Spec Ops (series). For the forces that perform spec ops, see special forces. Special operations (S.O.) are military, law enforcement or intelligence operations that are "special" or unconventional and carried out by dedicated special forces and other special operations forces units using unconventional methods and resources. Special operations may be performed independently, or in conjunction with conventional military operations. The primary goal is to achieve a political or military objective where a conventional force requirement does not exist or might adversely affect the overall strategic outcome. Special operations are usually conducted in a low-profile manner that aims to achieve the advantages of speed, surprise, and violence of action against an unsuspecting target. Special ops are typically carried out with limited numbers of highly trained personnel that are adaptable, self-reliant and able to operate in all environments, and able to use unconventional combat skills and equipment. Special operations are usually implemented through specific, tailored intelligence. The decade 2003–2012 saw U.S. national security strategy rely on special operations to an unprecedented degree. Identifying, hunting, and killing terrorists became a central task in the Global War on Terrorism (GWOT). Linda Robinson, Adjunct Senior Fellow for U.S. National Security and Foreign Policy at the Council on Foreign Relations, argued that the organizational structure became flatter and cooperation with the intelligence community was stronger, allowing special operations to move at the "speed of war". Special Operations appropriations are costly: Its budget went from $2.3 billion in 2001 to $10.5 billion in 2012. Some experts argued the investment was worthwhile, pointing to the raid in May 2011 that killed Osama bin Laden in Abbottabad, Pakistan. Others claimed that the emphasis on Special Operations precipitated a misconception that it was a substitute for prolonged conflict. "Raids and drone strikes are tactics that are rarely decisive and often incur significant political and diplomatic costs for the United States. Although raids and drone strikes are necessary to disrupt dire and imminent threats…special operations leaders readily admit that they should not be the central pillar of U.S. military strategy." Instead, Special Operations commanders stated that grand strategy should include their "indirect approach", which meant working with non-U.S. partners to accomplish security objectives. "Special Operations forces forge relationships that can last for decades with a diverse collection of groups: training, advising, and operation alongside other countries' militaries, police forces, tribes, militias or other information groups." ^ a b c d Robinson, Linda (November–December 2012). "The Future of Special Operations: Beyond Kill and Capture". Foreign Affairs. 91 (6): 110–122. Capt. Malcolm Brailey, The Transformation of Special Operations Forces in Contemporary Conflict: Strategy, Missions, Organisation and Tactics. Canberra, ACT: Land Warfare Studies Centre, Working Paper No. 127, 2005. Colin S. Gray, “Part III: Strategy and Special Operations”, Explorations in Strategy. Westport, CT: Greenwood Press, 1996, pp. 139–232. William H. McRaven, Spec Ops: Case Studies of Special Operations Warfare; Theory and Practice. Novato, CA: Presidio, 1995. Linda Robinson, One Hundred Victories: Special Ops and the Future of American Warfare, New York: Public Affairs, 2013. ISBN 978-1-61039-149-8 . 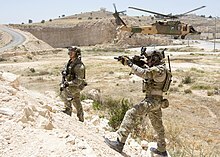 This page is based on the Wikipedia article Special operations; it is used under the Creative Commons Attribution-ShareAlike 3.0 Unported License (CC-BY-SA). You may redistribute it, verbatim or modified, providing that you comply with the terms of the CC-BY-SA.